The General contact note is appended to the property record only. The Vendor contact note is appended to the vendor record as well as the property record. The Applicant contact note is appended to the applicant record as well as the property record. When contact notes are appended to both a property and contact, they can be viewed on the property screen and the contact screen. To add a contact note, click the icon required and a panel appears. Clicking in the Date & time field brings up a date picker so you can choose a date and time other than the current. 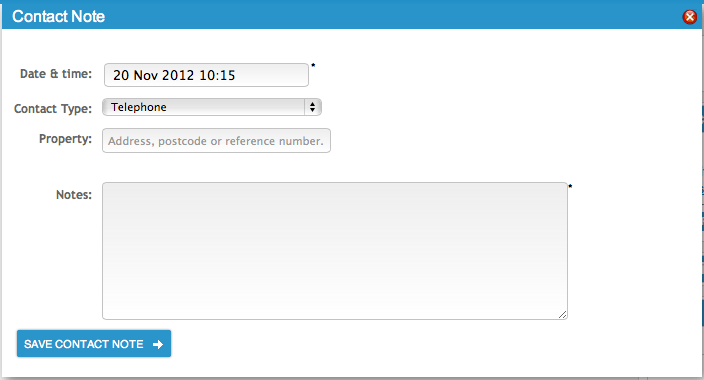 Click the drop-down box for contact type and choose from Email, Fax, in person, SMS or Telephone. Enter any notes and click the button to save the contact note. Contact notes are either editable or not editable depending on the configuration you BDP manager has selected.